If you care anything about grooves like I do, I’m a bass player, then you will find the groove in the above song fantastic. Sly and Robbie, one of the greatest rhythm sections ever, having worked on countless great reggae recordings, lay down the stickiest and deepest of grooves. Sly Dunbar’s drumming has me particularly captivated on this track. An interesting side note: Sly and Robbie also provide the rhythm tracks on Bob Dylan’s 80’s masterpiece Infidels. People have been talking about Dylan playing on Letterman’s second to last show. This is an interesting article about Dylan’s first Letterman gig, when he was struggling in the 80’s, around the release of Infidels. I’ve always loved Infidels. Dylan’s lyrics are amazing on that record. I also like the oddball combination of him with Sly and Robbie, the great reggae rhythm section. Another Dylan 80’s album I really like is Empire Burlesque. There are many that will bemoan the 80’s production, and I understand that urge, but the songs themselves are largely fantastic. Most Dylan fans will mention Dark Eyes, but Emotionally Yours, later made great by the O’Jays, is a fantastic ballad. Tight Connection to My Heart is also an excellent pop song with great lyrics. In some ways I feel like the 80’s production at times, if you can do away with your prejudice, makes lyrics like, “They’re beating the devil out of a guy who’s wearing a powder-blue whig”, even more insane and absurd, heightening the comedy. Lately I have been trying to discern what in particular gives Dylan’s writing a unique power. Entire books have been written on the topic, entire semesters have been taught. I am not going to solve the conundrum here. However, as someone that has spent more time than is healthy studying song lyrics, there is something I notice time and time again. Dylan has not only been prolific for most of his career, but his words also often gain power through sheer volume. I am a huge fan of Morrissey. Although he has written expansive songs like The Queen is Dead, he often writes couplets that are powerful statements in and of themselves. Leonard Cohen, someone by whose own admission is not prolific, yet is closer to Dylan in style, spends a lot of time finely crafting certain lines. If you take many Dylan couplets, although with his huge catalog he has written brilliant couplets as well, they are not always powerful in and of themselves. But by the time you get to the 7th couplet in 4th verse of a Dylan song (hypothetically), Dylan songs are often astounding for the sheer amount of language he packs in them, they begin to take on a cumulative poetic power. Where some writers get their power from cutting back until what lies before them is a finally crafted sculpture, Dylan almost seems to stand out of the way and let his subconscious pour forth. Line after line, image after image, floats past until the amount of imagery leaves the listener overwhelmed and breathless. Sure, that is not all he is doing. There is a difference in power between Dylan’s Like a Rolling Stone and Springsteen’s similar wordy Blinded by the Light. (I love Dylan and Springsteen, but I would be lying if I said the latter contained the poetic force of the former.) Dylan performs alchemy. He does get that missing piece of the puzzle that many others cannot find no matter how talented they are. This is not to say that Dylan cannot write shorter more traditional songs. He can of course. Again this is also not to say that Dylan cannot write great one liners and couplets, as he has done that as well. There are also many other elements at play to make a song powerful. However, I think, if you are interested in what Dylan does, this is a good facet of his writing to examine. 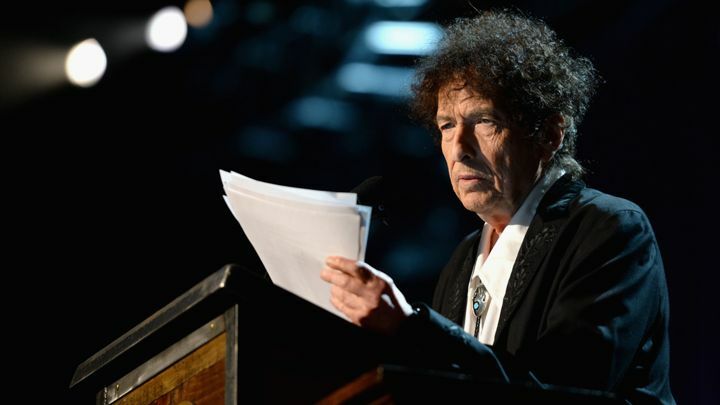 The above link is a transcript of a recent Bob Dylan speech that he gave recently in connection with the charity MusiCares. If you are even the slightest bit interested in Bob Dylan or music in general this speech is worth reading. The original speech was around 30 minutes long. In it he pays tribute to his heroes, talks about confounding critics, and calls out those musicians who were close minded during his early years. As I await listening to the new Dylan album, Shadows in the Night, which was released Tuesday, I wanted to post something off possibly my favorite late-period Dylan album, Love and Theft. Po’ Boy is one of my favorite songs from that album. (Though the whole album is fantastic, featuring a crackerjack band and great songwriting.) I love the fact that Dylan seems like he is having fun with language, even telling a knock-knock joke. The melodic old-timey chord progression and swing of the groove are a perfect for the lyrics. This song is Dylan at his most playful. Bob Dylan just released a collection of songs that Frank Sinatra sang called Shadows in the Night. I haven’t gotten around to hearing it yet, but I will at some point. The reviews so far have been fantastic. It doesn’t seem strange to me that Dylan would play tribute to Sinatra, not only because he is known to be a fan, but because Sinatra tried to crossover into 60’s pop on the great album Watertown. I believe I have mentioned this album before, as it is a fantastic piece of work. The album was not commercially successful at the time, which is a shame. It is a concept album about a working class kind of guy whose wife leaves him. It is a simple concept, but it is well done, as the album creates a mini-play in your imagination while you are listing to it. Sinatra could obviously sing almost anything, and it is great to hear him tackle some 60’s pop melodies. The above song, I Would Be in Love (Anyway) was just something I had to post. When he hits the big notes in the chorus it is just one of those wonderful pop music moments where singer and song and perfectly matched. If you like Sinatra or that kind of widescreen 60’s pop music, this album is definitely worth checking out.